I had no idea leprosy was still a thing. I thought it was just one of those old-timey Bible afflictions like the plague or demon possession that had a good run, but is basically gone now. It turns out I was mistaken and over a million people suffer from it world-wide, including over 6,000 in the U.S. In an even more surprising revelation, according to a study published in the New England Journal of Medicine, some of those U.S. leprosy cases were caused from handling armadillos. They’re the only animal aside from man that can carry the bacteria that causes the disease, so you might want to reconsider any plans of getting one as a pet. I’m actually a little disappointed to learn these little armored pig-looking things harbor diseases because I’ve always been enamored with them. When I was driving through Texas and saw one, I actually got out and chased it for a few hundred feet before it escaped down its burrow. I was tempted to reach in there and pull it out, but the combination of my wife screaming and my buzz fading convinced me it was a bad idea. On the plus side, only about 1% of leprosy cases are caused by armadillos, and those aren’t terrible odds. It also seems so long as you don’t live in the third-world, leprosy is fairly easy to cure. 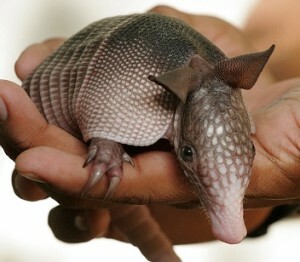 Moral of the story, if you’re not poor, have access to good healthcare and want an armadillo, I say go for it.